Flowed into Hetian and gave birth to a superior jade. In the western mountain ridge or northern valley loves such tales of immortals. According to Daoist legend, Fan Tong is the Daoist Paradise, the heavenly residence of the immortals. Reputedly located in the Kunlun mountains, the residences were entirely decorated using Hetian jade. The present lot belongs to a group of spinach jade brushpots carved with scenes of scholars and immortals in landscapes, and with the title of the scene incised on rockwork and an imperial poem around the top of the mouth rim. One such example, sharing the same poem and title with the present brushpot, was sold at Sotheby's London, 28 October 1988, lot 306, and again at Sotheby's Hong Kong, 31 October 2004, lot 229. 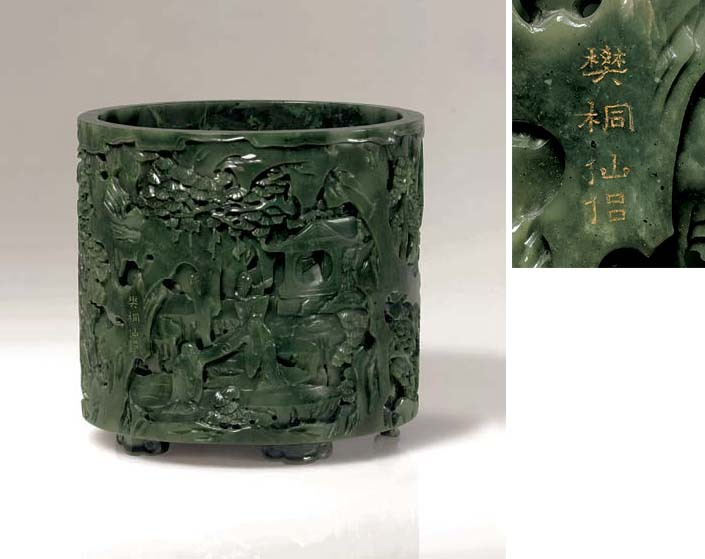 A spinach jade brushpot from this group, entitled Zhu Xi liu yi and with a different poem written in the Spring of the yimao year of Qianlong's reign, is in the Palace Museum, Beijing, illustrated in Jadeware (III), The Complete Collection of Treasures of the Palace Museum, Hong Kong, 1995, pl. 169. Two other spinach jade brushpots from this group are in the National Palace Museum, Taiwan, included in the exhibition The Refined Taste of the Emperor: Special Exhibition of Archaic and Pictorial Jades of the Ch'ing Court, Taiwan, 1997, illustrated in the Catalogue, nos. 55 and 56; and another is included in the Illustrated Catalogue of Chinese Government Exhibits for the International Exhibition of Chinese Art in London, Vol. IV, Miscellaneous, 1936, no. 43. Cf. other similar brushpot without inscriptions, such as the one in the Palace Museum, Beijing, illustrated op. cit., 1995, pl. 170; and a spinach jade chrysanthemum-shaped dish inscribed with the same poem, Fan tong xian lu, from the Beijing Palace Museum, illustrated in Zhongguo Yuqi Quanji, vol. 6, no. 74.